Atherosclerosis is a complex disease involving a variety of circulating blood components, lipoproteins, and their interactions with the cells and proteins of the extracellular matrix of the artery wall. The end stage lesion, which results in the occlusion of a vessel and/or provides a thrombogenic surface which leads to intravas cular thrombosis is frequently an acellular, fibrotic section of tissue reflecting the end stage of a complicated inflammatory process. The atherosclerotic plaque contains the cellular debris of dead and decaying cells and a variety of substances trapped amidst this debris, including cholesterol, chiefly in the form of precipitated crystals1. While many pathogenic mechanisms must be involved in transforming normal arterial tissue, which contains only a one-or two-layer thick intimal layer, into this highly thickened intima, it is nevertheless clear that deposition of cholesterol within the intima plays a central role in the pathogenesis of the atherosclerotic plaque. Because arterial wall cholesterol is derived almost exclusively from circulating lipoproteins, chiefly in the form of low density lipoproteins (LDL), research must focus on trying to understand the sequence of events by which the plaque develops and by which LDL accumulates2–5. 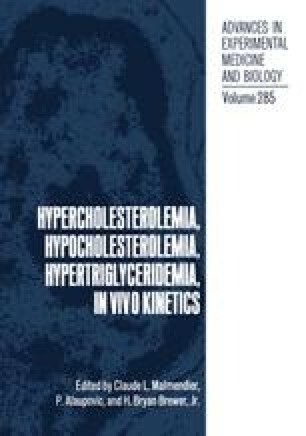 There are many lines of evidence that support the hypothesis that circulating cholesterol, principally in the form of LDL, is central to the atherogenic process and that without “sufficient” plasma LDL levels, the atherogenic process cannot proceed4,6.